We are running 6 photo tours in 2019 to Nepal, Namibia and Turkey – our favourite destinations that offer almost limitless opportunities to photograph unforgettable landscapes and spectacular wildlife. Philip and Ram first took this route to make the Pheriche Hospital documentary in 2006. They repeated the route in 2007 and 2008 to make the 'Everest +' documentary for the BBC. This photo expedition is the most spectacular and challenging that we run and will require good fitness levels. It's unique journey for a very small group of photographers through a diverse country of landscapes and cultures. The most mesmerising destination in Africa. Extraterrestrial landscapes, mountainous dunes and merciless deserts all made accessible when you join our 7 day photo tour venturing across Namibia to discover the spectacular Sossusvlei. The game viewing in these national parks is astonishing; giraffes, elephants, impalas, zebras and the endangered desert lion and black rhino, to name just a few. Join us on our 7 day photo tour of Africa's most spectacular wildlife and wilderness. Mountainous dunes, unrivalled game-viewing and German levels of efficiency are combined to create our once-in-a-lifetime tour of Africa's most mesmerising destination. Join us for 15 days of extraterrestrial landscapes, astonishing wildlife and unparalleled photographic opportunities. SALT LAKE - KYRGYZ MARQUEES. These are opportunities that cannot be missed and experiences that will fill your soul with joy. 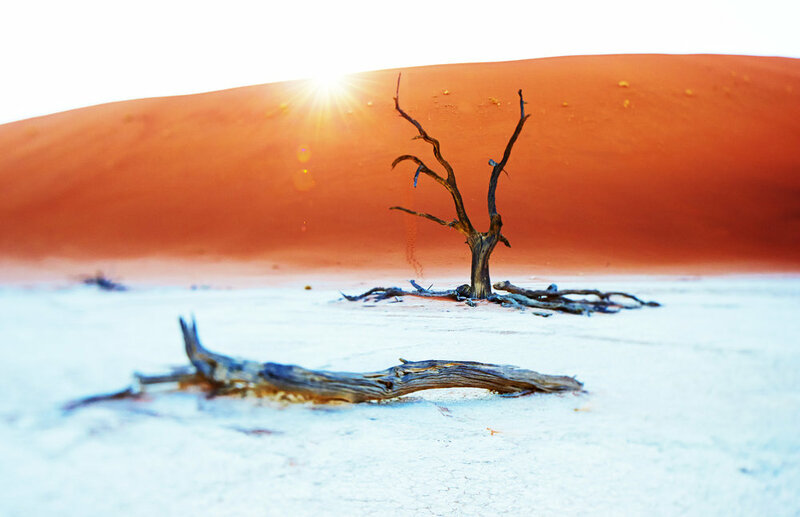 7 day photo tour where you will visit the most mesmerising locations in Namibia including Sossusvlei and Deadvlei. Venturing across the west of Namibia you’ll discover the Namib Desert and the spectacular Sossusvlei – framed by the world’s highest sand dunes which looms over Deadvlei – home to trees 700 years old. This tour has been tailor made by Philip North-Coombes and local expert Manfred Förtsch, to give you the opportunity to experience this remarkable location that offers diverse and almost endless photographic opportunities. You’ll hike up sand dune ridges, sleep under the stars and come away with a new perspective on how to approach your photography and a mind-blowing library of images. We'll stay is some of the best lodges in Namibia to ensure that you'll be well rested and fed after rewarding days in the wilderness. Some structured sessions are planned for the trip, but every moment of the journey is a chance to learn and experiment with your photography. We've organised a portrait session with the Kalahari Bushmen to give you the opportunity to learn how to light a shoot and shoot tethered directly to the laptop. As with all of our tours Philip and Tim will be with you every step of the way to guide and assist you with your photography and offer their professional perspective. They'll also bring a selection of professional level Canon lenses and bodies for you to try out. Price Includes: Dune hike, Kalahari Bushmen portraits, star photography and cheetah safari. Daily one-to-one tuition from Philip and Tim, guidance and insight from our local guide. Airport transfers, accommodation as listed; 2 nights Hilton Hotel, 2 nights Sossus Dune Lodge, 1 night Namib Dune Star Camp, 1 night Bagatelle Kalahari Game Ranch, all meals and transportation. Price Excludes: International flights, travel insurance, hot air balloon ride (subject to weather conditions), single supplement £155 / $185. Airport Transfers to Windhoek. Welcome chat and introduction from Philip, Tim and Manfred. Group get together and a good chat over dinner. Overnight at the Hilton Hotel. Drive to Sossusvlei via the breathtaking Spreetshoogte Pass for epic vistas and Solitaire for lunch (and great apple pies! ). Enjoy a Sundowner with drinks and Snacks on the Elim Dune. Overnight at Sossus Dune Lodge (Dune Chalets). Overnight at Namib Dune Star Camp. Post production work on star photography before leaving to Bagatelle. Afternoon we will go on a game drive and take you cheetah feeding followed by a sundowner and sunset photography on the dunes. Overnight at Bagatelle Kalahari Game Ranch (Savanna Chalet). A large backpack / holdall plus smaller backpack for equipment. Your camera – if you have a selection of lenses we recommend a 24–70mm for this trip. If you have a laptop please bring it along. We use Capture One Pro, Lightroom and Photoshop for post production but will be able to assist you with any software you use. Please feel free to email or call us if you have any questions in regard to equipment. If you're interesting in finding out more about this tour or you would like to make a booking please email or telephone Philip, Bruce or Tim directly. On this 7 day wildlife photo tour you will visit Etosha National Park and the Erindi Private Game Reserve. The game viewing is astonishing; with giraffes, elephants, elands, kudus, impalas, springbok and zebras trying to stay one step ahead of healthy numbers of lions, cheetahs and leopards. The biggest draw here though is the black rhino, and the best place to see them is at one of the many watering holes. You'll have the opportunity to see these magnificent creatures up close (well close enough!) and capture pictures to treasure. We understand how important space is when game viewing to enable you to get the best shots – we ensure everyone has a 'window' seat so you get a clear view of the wildlife action as it unfolds. We'll stay is some of the best lodges in Namibia to ensure that you'll be well rested and fed after rewarding days in the wilderness. Some structured sessions are planned for the trip, but every moment of the journey is a chance to learn and experiment with your photography. We've organised a portrait session with the Nomadic Bushmen to give you the opportunity to learn how to light a shoot, shoot with screens and directly to capture one. As with all of our tours Philip and Tim will be with you every step of the way to guide and assist you with your photography and offer their professional perspective. They'll also bring a selection of professional level Canon lenses and bodies for you to try out including a EF 200mm-400mm f/4L lens. Price Includes: Open game drives and Etosha National Park and Erindi Private Game Reserve, conservation talk given by local experts, portrait session with the Bushmen Nomadic Tride, daily one-to-one tuition from professional photographers Philip and Tim, guidance and insight from our local guide. Airport transfers, accommodation as listed; 2 nights Hilton Hotel, 2 nights Etosha Village, 2 nights Erindi Old Traders Lodge, all meals and transportation. Price Excludes: International flights, travel insurance, single supplement £220 / $670. We set off in good time to the Etosha Village. Lunch on arrival and time to check and set-up equipment before a afternoon game drive in our tour vehicle. An early start to prepare for a full day game drive taking you to the most spectacular spots in the National Park. We will have lunch on the field to maximise the locations we are able to visit. On return to Etosha Village local expert Sarah will give a talk on the ongoing giraffe study at the Park. A stunning drive in our tour vehicle to Mokuti lodge across the National Park with stops on the way to take in the breathtaking scenery. In the afternoon we will have a post production session. Overnight at the Mokuti Lodge (Standard room). Early start to leave Etosha National Park and drive to Erindi Private Game Reserve followed by a game drive in the afternoon at this unique location. Overnight at the Erindi Old Traders Lodge (Luxury room). An early start for a morning portrait session with the Bushman Nomadic Tribe. We'll set up a lighting rig and shoot directly to laptop to give you the opportunity to take intimate photos of this local nomadic tribe. We'll head back to Windhoek after lunch for a group get together to go through your photography before a farewell dinner. A large backpack / holdall plus smaller backpack for equipment. Your camera – if you have a selection of lenses we recommend you bring the longest you have plus converters if you have any. If you have a laptop please bring it along. We use Capture One Pro, Lightroom and Photoshop for post production but will be able to assist you with any software you use. Please feel free to email or call us if you have any questions in regard to equipment. We will be bringing along a good selection of professional Canon bodies and lenses including a EF 200mm-400mm f/4L for you to try out. If you're interesting in finding out more about this tour or you would like to make a booking please email or telephone Philip or Bruce directly. Our photo tour to Namibia's most mesmerising locations including Sossusvlei, The Skeleton Coast, Etosha National Park and Erindi Game Reserve. The most mesmerising destination in Africa – Namibia combines mountainous dunes, extraterrestrial landscapes, an eerie fogbound coast, merciless deserts and stars so numerous you can read a book by their light. The wildlife is equally impressive – from the regal oryx to the endangered desert lion and black rhino. This outstanding natural beauty is made accessible by good infrastructure – a legacy of Namibia's time as a German colony. Philip and Manfred have combined all there favourite visual and cultural spots into a 16 day photographic tour of this magical country – from the sand dunes, sea birds and seals of the Skeleton Coast to the antelopes, giraffes and elephants of Etosha National Park, the ancient bushman carvings of Twyfelfontein and the petrified trees and mountainous dunes of Sossuslvei. We understand how important space is when game viewing to enable you to get the best shots – we ensure everyone has a 'window' seat so you get a clear view of the wildlife action as it unfolds. We'll stay is some of the best lodges in Namibia to ensure that you'll be well rested and fed after rewarding days in the wilderness. Some structured sessions are planned for the trip, but every moment of the journey is a chance to learn and experiment with your photography. We've o rganised a portrait session with the Nomadic Bushmen to give you the opportunity to learn how to light a shoot, shoot with screens and directly to capture one. As with all of our tours Philip and Tim will be with you every step of the way to guide and assist you with your photography and offer their professional perspective. They'll also bring a selection of professional level Canon lenses and bodies for you to try out including a EF 200mm-400mm f/4L lens. Price Includes: Kalahari Bushmen portraits, Sossuslvei dune hikes, Deadvlei, star photography, catamaran cruise in Walvis Bay served with sparkling wine and Oysters, tour of the Skeleton Coast, nature drive in search of the desert adapted Elephants, visit to the Petrified Forest, game drives in Etosha National Park, talk by local conservation expert and cheetah walk. Daily one-to-one tuition from Philip and Tim, guidance and insight from our local guide. Airport transfers, accommodation as listed; 2 nights Hilton Hotel, 1 night Bagatelle Kalahari Game Ranch, 2 nights Sossus Dune Lodge, 1 nigt Namib Dune Star Camp, 2 nights Desert Breeze Lodge, 1 night Terrace Bay Lodge, 2 nights Camp Kipwe, 2 nights Etosha Village, 2 nights Erindi Old Traders Lodge, all meals and transportation. Price Excludes: International flights, travel insurance, hot air balloon ride (subject to weather conditions), single supplement £420 / $510. Airport Transfers to Windhoek. Welcome chat and introduction from Philip, Tim our local guide. Group get together and a good chat over dinner. Overnight at the Hilton Hotel. Depart in good time to Bagatelle. We will take an early afternoon walk to the Kalahari Bushmen Village from the Ranch where we will set up for a portrait session with the Bushmen and give you the opportunity to learn how to light a shoot, shoot with screens and directly to capture one. Overnight at Bagatelle Kalahari Game Ranch. The Game Ranch offersn the perfect opportunity for a post production session on the portrait photography for the previous day. Drive to the Sossus Dune Lodge. Enjoy a Sundowner with drinks and Snacks on the Elim Dune. Overnight at Sossus Dune Lodge (Dune Chalet). Early Wake-up call, drive to Sossusvlei and Dead Vlei for sunrise photography at this magical location. Afternoon trip to Dune 45 for sunset photography. Overnight at the Sossus Dune Lodge (Dune Chalet). Overnight at the Namib Dunes Star Camp. We depart to Swakopmund driving through the northern Namib Naukluft Park taking the nature trail route which offers some wonderful opportunities to capture the landscapes en route – stopping at designated areas including the Lunar Landscape range and Solitaire for the famous apple pie at Moose McGregor's bakery. Overnight at the Desert Breeze Lodge . Catamaran Cruise in Walvis Bay served with sparkling wine and Oysters to spot seals, pelicans, dolphins and other marine life. The afternoon is spent at leisure with the opportunity to go through post production with Philip and Tim or to go on a wonder around the town of Swakopmund, get supplies, shop, visit the Museum and take photos. Overnight at the Desert Breeze Lodge. An early start and drive to Cape Cross along the Skeleton Coast visiting the seals and stopping at various key locations that offer photographic opportunities including dune and ship wrecks. We end the day at Terrace Bay where the amenities are basic but charming! After breakfast we set off to Damaraland – it's beautiful and terrifying with immense shimmering gravel plains that narrow into dry riverbeds in deep gorges and home to desert adapted elephants. We'll take in the Damaraland Living Museum and visit the Twyfelfontein Rock engravings before settling into the stunning Camp Kipwe to enjoy a sundowner with a view – ideal for photos! Overnight at Camp Kipwe (Bungalow). In the morning we take a Nature Drive in search of the desert adapted Elephants. The afternoon is spent with a post production session and leisure time. Camp Kipwe is one of our favourite places to stay and a great opportunity to go for a wonder and find great photo spots. It's a four hour drive to Etosha so we set off in good time. En-route we stop at the Petrified Forest which offer great photo opportunities. In the afternoon we set off for our first game drive at Etosha on search of giraffes, elephants, impalas, zebras and more. There are many great days on this trip but this is one of the highlights. A full day game drive into the immense pan of white sand on the bed of a long-vanished lake in search of magnificent creatures including the rare black rhinos. Etosha truly is magical and is one of our favourite spots of this mesmerising country. The day is ended by a talk with Rachel on a giraffe study conducted in Etosha National Park. Overnight at the Etosha Village. Early start to leave Etosha National Park and drive to Erindi Private Game Reserve. Erindi is another very special place where they are passionate and incredibly well informed about the wildlife and always keen to pass on their knowledge. In the afternoon we'll go on a game drive with the opportunity to view cheetahs and leopards and more. We get out of the vehicles and make the most of the local guides who will take us on a bushman walk to explore the area and view cheetahs. The afternoon is a great opportunity for post production with Philip and Tim. Our final game drive of the tour before we head back to Windhoek after lunch for a group get together to go through your photography before a farewell dinner. A large backpack / holdall plus smaller backpack for equipment. Your camera – if you have a selection of lenses we recommend you bring the longest you have plus converters if you have any. If you have a laptop please bring it along. We use Capture One Pro, Lightroom and Photoshop for post production but will be able to assist you with any software you use. Please feel free to email or call us if you have any questions in regard to equipment. We will be bringing along a good selection of bodies and long lenses for you to try out. Arriving at Everest Base Camp. Our photo tour of Nepal including Everest Base Camp is the most spectacular and challenging that we run and will require a good fitness level. You will experience the chaotic grace of Kathmandu, spend time with and photograph the majestic monks of Tengboche, experience the famous Mani Rimdu festival, visit Everest Base Camp and trek to heights of over 6,000 metres to witness the grandeur of Everest and the region it looks over. At times we are in very remote locations so accommodation and food is can be basic. It's a unique journey for a very small group of photographers through a diverse country of landscapes and cultures. Philip and Tim will be there every step of the way to help you to get the right sunset, to access the most idyllic wilderness, to meet diverse ethnic groups and to make sure you have the time to explore your photography in the process – they'll also bring a selection of professional level Canon lenses and bodies for you to try out. Some structured sessions are planned for the trip, but every moment of the journey is a chance to learn and experiment with your photography. Philip and Ram first took this route to make the Pheriche Hospital documentary in 2006. They repeated the route in 2007 and 2008 to make the 'Everest +' documentary for the BBC. Price Includes: All accommodation and meals. Internal return flights to Lukla. Guides, portrait photography with the Tengboche Monks. Price Excludes: International flights, travel insurance, single supplement TBC. Arrival at Kathmandu airport, clear customs and meet up with your driver. Hotel stay in the Thamel region of Kathmandu. Meet and greet and dinner at a traditional Nepali restaurant in the heart of a vibrant and bustling capital city. Breakfast and a meeting with Philip, Tim and Ram to go through equipment and settings and any immediate questions you may have. Time to wander around the shops get supplies and any additional gear for your trek to Everest Base Camp. Our guides will brief you and help you sort out all the equipment for the trip. The excitement and anticipation will be building now for the adventure to come. In the afternoon we will visit the famous Durbar Square and for sunset go to the Monkey Temple- Swayambhunath temple. Early start to the airport for our flight to Lukla. So the adventure really begins. Lukla is a small isolated airport in Solukhumbu District and the gateway to the Khumbu. At 2,860 meters it makes for an exhilarating 25 minute flight that can be bumpy! At Lukla we will gather all our belongings, meet with our porters and begin a leisurely trek to Phakding. The trek is about 3 hours but take your time to take photographs as there will be plenty of opportunities along the way. Settle into Lodge on arrival and relax and regroup. Discuss your day and the photos you took. Today we enter Sagarmatha (Everest) National Park in Nepal, a UNESCO World Heritage Site. The strenuous part of the trek begins as the trail is mostly uphill. It could be busy with locals with Yaks – we cross suspension bridges and travel through villages – all offering superb opportunities for photography. A 700 meter climb to Namche. Namche is a staging point for many expeditions and gives us a perfect opportunity for acclimatization. It is at 3,440 meters. A village with lots of local life and activity. Stalls, lodges, and shops. In the afternoon we have a perfect opportunity to discuss post production. Acclimatisation day in Namche. We will take a short hike to Sagarmatha National Park's Headquarter where there's a small museum. We will then climb the hill towards Hotel Everest View at 3880m. The Hotel first in 1971. From here you enjoy a 360 degree view of the Himalayas and a view of Everest. We will be back in Namche for lunch. The afternoon can be spent exploring the local market and the streets. It gives everyone the opportunity to spend time capturing images of the heart and soul of Namche and its residents . Early start and trek up to Syangbouche, one of the highest airports in the world and is now abandoned apart from the occasional helicopter landing. We are heading for Khumjung at 3,790 meters. There we will find a school built and run by the Sir Edmund Hilary foundation and monastery with the preserved skull of a yeti! Early breakfast and start. The trek to Tengboche starts with a long descent to the river. We will have lunch at Phungi Tenga once crossing a suspension bridge. We will take it slowly as we climb steeply to Tengboche where the Tengboche monastery is located. The monastery is Khumbu’s largest Buddhist Gompa and the famous Mani Rimdu festival takes place here every October / November. We will be spending two nights here to take in the surroundings and continue our acclimatisation. On arrival we will go to our lodge and than we can wander around and take some photographs of the area. The monastery is majestic and dominates the top of the hill. We will also spend time on post production techniques. A day of photography at the last day of the Mani Rimdu Festival and portrait photography with the monks from the monastery. We will spend time after the shoot to discuss post production. Dinner at lodge and early night ready for an early start the next day. Early start for a trek to Pheriche at 4,371 meters. This is also our acclimatisation stop. A change of landscape gives you more opportunities for Photography along the way – it becomes more barren and dusty as we escape from the tree line. In the afternoon we will be visiting the Himalayan Rescue Association medical clinic where we will also attend a talk on high altitude sickness by one of the doctors. This is a familiar setting as we made many documentaries for the BBC in 2005,2006 and 2007 here. It was rebuilt and is sustained by the Everest memorial trust. We'll have time to wander and enjoy Pheriche before dinner at lodge. In the morning we will trek up to Dingbouche Ri (5075m) to assist our acclimatisation. The hike is challenging but well worth it as the view of the valley is stunning and a perfect time for photography. Take time to rest and relax before the trek to base camp. Chance to experience local life in Pheriche and mix with the local residents. Feel free to take portraits. Use every opportunity for photography as there will be plenty of them. Re-pack and dinner at lodge. An early start. The distance from Pheriche to Lobouche is not great, but the vertical gain makes it more challenging. We will start slowly towards Dughla. After lunch we'll head towards the Lobuche Pass where there are memorials dedicated to climbers and expedition teams who have lost their lives on Everest. Take your time and take photos respectfully –it's a profound reminder of how dangerous climbing the highest mountain in the world can be. 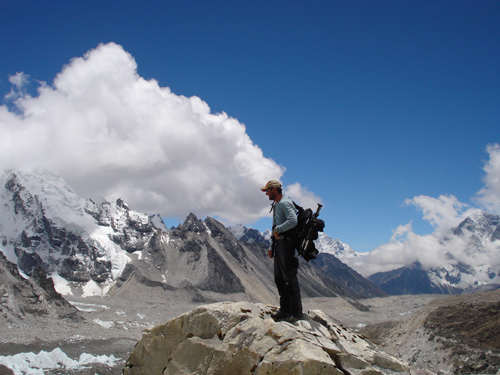 Lobuche is a small place and at 6,119m one of the highest points of the expedition and the mouth of the glacial landscape. We will feel the climb, so spend time relaxing, reviewing your photos and discussing ideas with Tim and Philip. Dinner at lodge. Today we will head out early to Gorakshep, stop for lunch and then hike up to Kalapathar for a sunset view of the Himalayas and Mt. Everest. The hike up to Kalapathar is difficult because of the vertical gain in altitude and decreasing oxygen levels. However, if you’re well acclimatized the ascent is not more than two hours and the descent is quite easy. The climb is definitely worth it as you will come back with panoramic photos of the Himalayas. Dinner at lodge. Early start Everest Base Camp. The trek is tiring and the terrain very remote and glacial-rocky and unstable. We will have the chance for some landscape and panoramic photography and get a sense of the enormity and potential dangers of climbing Everest. This time of the year there may be camps or it might be totally deserted. In Spring, Base Camp is a thriving endless hub of expeditions, climbers,sherpas, café’s etc. There is also a Medical clinic here which is where we spent much time making the BBC documentary 'Everest +'. We will then trek back to Gorakshep for dinner and rest. Today is the start of our decent. Ultimately to Lukla and then Kathmandu. We will walk through the glacier back to Lobuche and have lunch. We will encourage you to do this descent solo – it's one of Philip's personal highlights so we think you should experience it to! Meet at the lodge in where we will regroup for dinner. This will also enable you to take time to focus on your own photos as you trek down. Philip and Tim will be following and can always lend a hand. Dinner all together in Pheriche! We will be hiking down the same route back to Tengboche. Again today you will be on your own to walk and take photos as you like but you must ensure you reach Tengboche on time. During the afternoon we will explore the monastery and surrounding areas for the right locations and light to take great shots. Dinner in Lodge. Continuing our hike down we will set off in good on a new route passing through Phungi Tenga followed by a climb to Kyangjuma. There are some spectacular views along the way. We will cross Namche, cross the bridge and walk straight to Monjo where we will rest for the night. An early flight will take us out of Lukla and the Khumbu, back to Kathmandu. The take-off from Lukla airport offers remarkable views (weather permitting!). Once back in Kathmandu you will have the rest of the day to enjoy this great city. We will be happy to accompany you to certain spots or advise on great places visit. Meet in the evening for drinks and dinner. An extra day in Kathmandu for shopping or sightseeing if you are interested in visiting some places we can arrange that for you. Use the time to take some more photos, do some post production, edit the photos you have. In the afternoon we will meet, have a drink and everyone will have the opportunity to show a selection of their favourite photos from the previous 18 days! We will then take you for farewell dinner at Rum Doodle restaurant. This is a unique restaurant in Kathmandu where they have signatures of all Everest summiteers – and the preserved foot of a Yeti. Breakfast and the morning at your leisure. We will arrange a de-briefing for those who don’t have early flights. Transfer to Airport. This tour allows you the opportunity to work with Wild Horses and their riders in the nomadic landscape of the Sultan Sazligi National Park., the salt lake of Kyrgyz Marquees as with the image above. This offers you the chance to produce epic and dynamic imagery and Photographing almost 300 Wild Yilki horses, of the Anatolia, in their habitat. The tour also takes in the unexpected and incredible landscape that is Cappadocia. Moments that are unforgettable and capturing these on your camera will enable these moments to stay with you forever. - As an option; with participants who wanna make some star exposure, we can do at that night. Not obligatory. - Star exposure workshop at the best points of Cappadocia if desired. - Photographing sunrise with landscapes if desired. N O T E : Depending on the weather, the daily programs could exchange because our main purpose is taking the best photos ever! - A guide and a translator will be with us for entire tour. - The hotels could change according to the season and bookings of the hotels. But always the hotels will be at the same standard. - Meals will choose from special flavors and cuisine of every city and services will be provided from the most famous restaurants in the city. During this tour, as a photography tour you will have the best photographical locations withthe consulting of our professional photographer Nuri Çorbacıoğlu, as a expedition tour youwill see the best points, rarely known places of the cities with our guide and lastly as agourmet tour, you will have the best cuisine of the places, you won’t turn back until you tasteevery special food! ** The workshop fee does not include airline tickets. • Nuri Çorbacıoğlu Journey to Anatolia Photo Tours have the right of change the programcontent according to weather conditions, road conditions and unintentional adverse situations. • In case of the tour cannot fill the minimum quota, the tour will be canceled, theparticipants will be informed about the cancel and the attendance fee will be pay back. • Hotels could change because of the sessions or different reasons. But the quality of thehotels and services always will be standard. • Walking shoes and comfortable trousers to protect the ankle. This tour covers many of the destinations as the 5 day tour with the addition of going to Kapuzbaşı Waterfalls, which is known as the second largest waterfall in the world. 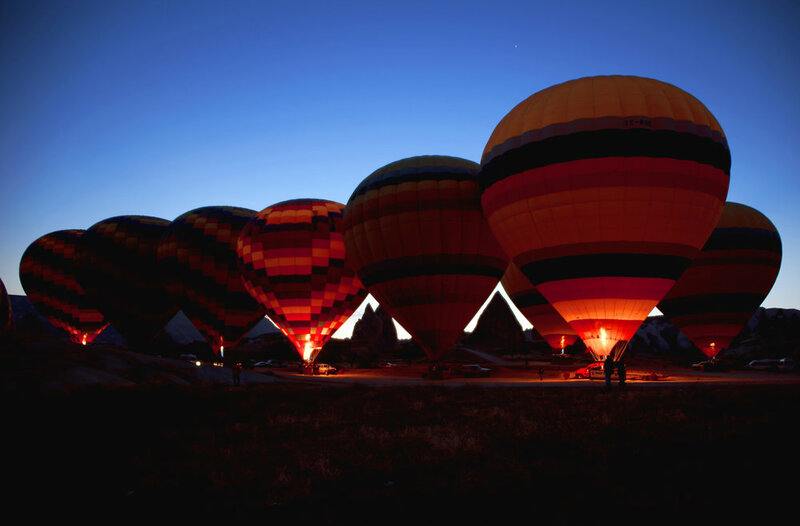 - Landscape and balloons photographing at the sunrise if desired. We are running 4 tours.